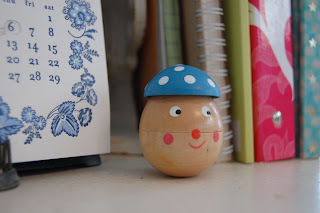 Today we get to see the new home for Mr. Blue Roly-poly Mushroom! 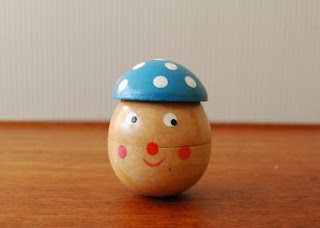 He looks very happy and radiant with all the bright colorful surroundings in his new home. Especially next to Ilee's letterpress calendar, which I have one myself as well and I absolutely adore her work! (She's based in Seattle, too!) Melissa has a collection of all sorts of mushrooms. So I'm sure Mr. Mushroom feels right at home! Check out photos of Melissa's adorable collections around her lovely house here. Thanks Melissa for submitting the photo! This looks staged, but I actually found them arranged just like that!! Someone just put these beautiful roses on our apartment porch. I'm not a total rose person, but I have to say it was such a nice pleasant surprise on a quite snowy day like this. So lovely. 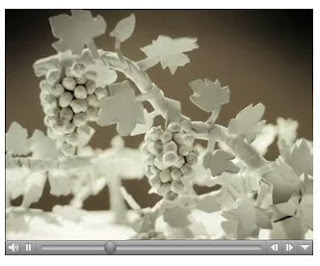 Another fun and inspiring commercial made strictly out of paper by Su Blackwell. It's so mesmerizing....and amazing. 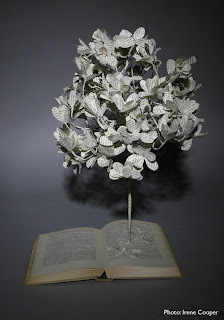 She does some unbelievable things with paper and books. Believe it or not, Miranda July here is going to take you on a magical journey of how buttons are made. Quite unbelievable....in a Miranda July way. We got these AMAZING and beautiful beats from Ballard Farmer's Market. I never knew Beets can look like this!! 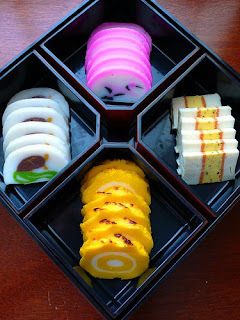 They remind me of colorful Japanese food, such as yellow tsukemono, or the bright pink kamaboko. These beets tasted just as lovely and sweet as they looked. Here are all the piece Dylan and I did over the 10 week wheel throwing course at Greenlake Community center. These are unglazed, so we still have to go through the agony of waiting for the final results of all the pieces in their fully glazed state. We started looking through all the shelves and kept finding pieces that we didn't even remember making!! I was surprised how many things we actually made! I think part of it was because many pieces were only 2-3 inches tall (I like making little things), and I made sure that we used ALL of our clay....none wasted! I struggled in the glazing phase since there were so many pieces to glaze. I kept finding myself having internal debates in my head about whether to keep it simple but boring by using white or be experimental but risk having bad results with other glazes. It's really tough not knowing for sure how they'll turn out!! We'll be picking them up this coming Thursday, and I'm actually really nervous about seeing them.........Oh god! are they going to look like crap!? It's killing me! But we won't find out until Thursday! I just gotta keep my fingers crossed....tightly. Last weekend I went to Eugene OR to visit my best friend, Kellie. I had her take me to a few antique stores and I found a few of these fabulous fabric yarn balls. They were all made with various cotton printed fabric, which had so much charm. Seeing them in the store inspired me to hit some thrift stores the following day to pick up some random fabric....and then next thing we know, Kellie and I were sitting on the couch ripping fabric like we never done before. There was something so therapeutic about ripping fabric...I can just sit and listen to music and make bunch of these....and not have to think about anything else. It was great! The few in the bowls are a mix of ones I purchased from the antique store and ones I actually made myself. These are the ones I made. I really love how it all looks when there's a BUNCH of them....so colorful and shabby chic! Plus it was effortless and fun! I'm thinking to make A LOT of them ....enough to make a room full of those balls....like the ones that kids play in. Wouldn't that be fun? They sure are little bundles of joy!! This is part two of our story time. Today I'm going to show you this great 'Betty Crocker's Good and Easy' Cook Book filled with fun printed illustrations that I found at a Goodwill. Not only does the book include good n' easy recipes...and not so appetizing looking food, they also provide useful tips for other food related activities. Here, they provide tips on how to pack a 4 star lunch box for the man, the young lady, and the school child. You just gotta make sure not to get them confused, because you don't want the man end up carrying the fabric wrapped lunch that could make him look too attractive while he eats his lunch. Here on this page, the book provide tips on how to make coffee in various ways, such as using a percolator, dripolator, vacuum maker, steeped in a pot, frozen coffee, and instant coffee. I love the drawing style in the two color printing format. I haven't tried the cake mix magic recipes...nor anything else. I think I would have to read through them to replace ingredients such as lard for something better. I'm tempted to have a party where everything I make is from this book and see how people react to it. But it might backfire and no one will ever come to my party in the future...Hmm. This is a old 60's apartment building in Capitol Hill, close to Harvard Exit theater. It's an understated building that you can just walk by and not notice it. But once I stopped to take a look at it, I started noticing all these interesting things about this building. I just love the pattern of the white ceramic tiles. They reminds me of Heath ceramic tiles, which I want use everywhere on my house!! when I own one that is. 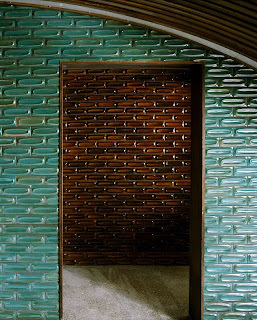 There is something graphically striking in the building as whole....the white relief tiles mixed with the rusty tiles, the various sized windows that runs to the edge of each section....It all seem so intricately planned and intentional. Click on photo to link to our Flickr. I found this adorable Hornsea mug at a Value Village the other day and was totally psyched! I was by myself and was literally freaking out in my head....I got a high from finding this. Unfortunately I'm not going to keep it. Instead I'm giving it to my friend, Chika, who had recently developed an obsession for Hornsea mugs and housewares. She's been on a bidding rampage to collect a bunch of them. The animal ones goes for quite a bit on Ebay...so she better have to find something good for me in return. The Hornsea mugs are made in England, designed in the early 70's by John Clappison for Hornsea Pottery. Each character is made from newsprint with words all over them. They're quite delightful and it's pretty rare to see them in the states, let alone Seattle...So that's why I got so excited!! This is a collection of Hornsea mugs from H is for Home. Such a striking photo to see them all together like that! Another great find of the month are these colorful and fun vintage tea towels that I got from the antique store with all the oil cans. There were all in a pile and I was literally picking them up and was going "Keep, keep, keep.....oh yeah, that's also a keep...keep, and keep!!!" I've been looking for cute vintage tea towels and haven't had much luck, and then now all of sudden I find 7 of them all at once!? what a lucky day! I love all the color combination, the subject and the illustration style.....penguins with hearts and playing piano?? I mean...COME ON! The four on the bottom with bunch of housewares illustrated have the same graphic, but all are in such lovely color combinations that are super inspiring. I found these great vintage books recently with the best two color printed illustrations inside. One books is a kid's book called 'The Man Who Didn't Wash His Dishes' (gross...I know), and another is 'Betty Crocker's Good and Easy' cook book (not so good, but maybe easy). Both have illustrations of various housewares, which is why I'm so in LOVE with it! Today the story I'm telling is about a man who didn't wash his dishes. Look at all those lovely bowls, plates, and pots all piled up precariously...that man is a very BAD man....that's not how you should treat your dishes! The man uses his dishes everyday and leaves it everywhere piling up all over his house, unwashed. As days pass, he uses more clean dishes and leaves more of them unwashed until he finally ran out of all the clean dishes he can use! So he had to resort to using his soap dish from his bathroom! eeeeeeeeeeew. But now what? he has no dishes to use left. AH-HA! The man came up with an idea (he even got a light bulb by his head for this idea!) His solution to cleaning all the dishes was........to put all the dishes in his truck while he drove around in the rain!!!! WHAT?!......WHAT!? The RAIN isn't going to clean out all the grease or any of the the crusty crumbs that are stuck on the edges...you crazy man!! But that's how it ended. Him eating out of the dishes that were washed in the rain....It's story that's supposed to teach kids a lesson about washing dishes, but I'm not sure how good of a message they're giving to the kids on this one. It should of been a story of how all the dirty dishes got so dirty and mad that it became a giant dish monster and ate the man who didn't wash his dishes.....THE END. I've been having fun with wheel throwing for the past 8 weeks, but felt like I needed to do something more experimental with patterns. So I decided to take out my set of old linoleum alphabet stamps to stamp on clay! I was totally itching to use my stamps, because I haven't used it since making Christmas gift tags....It's been awhile. I was screwing around with the stamps. I didn't keep the design. I used letters instead. The color of the stamps are from the ink, which unfortunately won't stay after being fired. I guess I can hand glaze each letter, but most likely it won't look as clean as the photo. Hmm...dilemma. I might just glaze it white, since you can't go wrong with white....I'm very cautious with the glaze, because it's a breaker deal with this step. It doesn't matter how cool the piece looks, if it has crappy looking glaze, then you might as well throw it against a wall....or throw at somebody you hate. I'm exaggerating, but pretty much it just gets ruined if the glaze don't turn out the way you expect. We'll see in a few weeks! Dylan and I went to this old run down antique store North of Seattle and saw a whole shelf of these motor oil cans. Never realized how neat they are with all the various graphics, colors, shape and sizes and everything! Dylan and I started taking a ceramic class beginning of January as a Christmas gift for ourselves. I haven't worked with clay since high school, and didn't get much out of it since my teacher failed to teach us anything, so I stuck with hand building vs. wheel throwing. Dylan took a wheel throwing class for a quarter at UW while his teacher would show up to class drunk or hungover....so enough said. But we started taking a wheel throwing class at the Green Lake community center (only $140 for 10 weeks! ), and it's been a blast! Most of the time it's been frustrating, but once we warmed up and starts to make things that we actually have in mind....then it's great! But Here are some few things we made.....most of them are all not centered. It's totally wabisabi....uh, yeah! Totally intentional....yes. I made the elephant and the lettuce bowl. Dylan made the cute cup with a flattened top, and the yellow interior pot. As part of the plan to eliminate every building with character, one of Seattle's Georgetown area's landmarks has been slowly meeting its demise over the past month. Formerly the storage facility for Rainier brewery, it more recently has been filled with the studios of a lot Seattle's artists and creative peoples. I'm not going to tell the whole story (because I don't know the whole thing), but you can read more here. Fortunately, part of the building still remains and is still being used by a variety of artists. Here's a few more pics. Check out flickr for more! 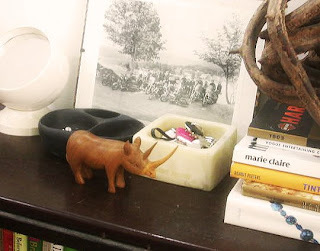 This is from Yvonne from Singapore who adopted the rhino and the pair of white ceramic birds from L&G. 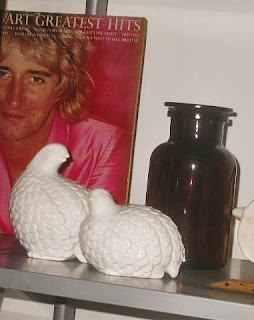 Birdies and Rod Stewart, how great is that!? The rhino stands oh so contently... 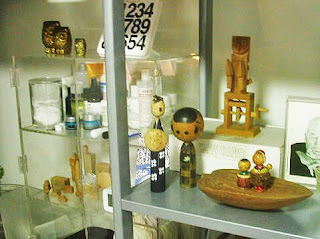 This is Yvonne's neatly arranged collection of Kokeshi dolls from Japan. I'm starting to collect these as well. The art behind making these precious Kokeshi dolls is beyond amazing. Most dolls are traditional and folk-like, but there are some dolls that are very refined and modern. They use simple painted lines to indicate their facial expression and personality. They also many times incorporate unconventional natural material such as straw, walnut shells, twigs, sea shells, clam shells and all sorts of other thing as their body parts. It comes in all shape, size, and form, and they're all very animated and adorable. Thanks Yvonne for submitting these photos! 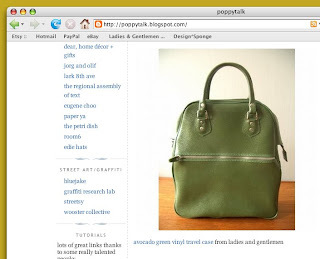 Jan from Poppytalk blog posted a couple of things from L&G on Feb 28th!! How exciting! Thanks Jan! 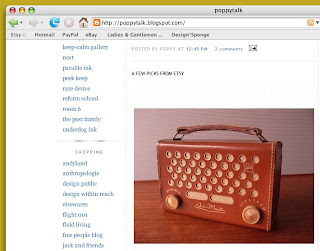 I'm starting to sell on PHM (Poppy Handmade Market) store starting March 11th. There's tons of great things, which got me totally tempted. But I pulled myself back from buying things.....for now.